Our scanning capabilities supplement our analysis and design work. Traditional field work often requires return visits to double check dimensions or take extra pictures. A 3D scan of your facility saves time and money, and gives you an accurate 3D digital model. The scanner uses a laser beam to capture data points as it reflects off surrounding surfaces, and a built-in camera applies color to those points. 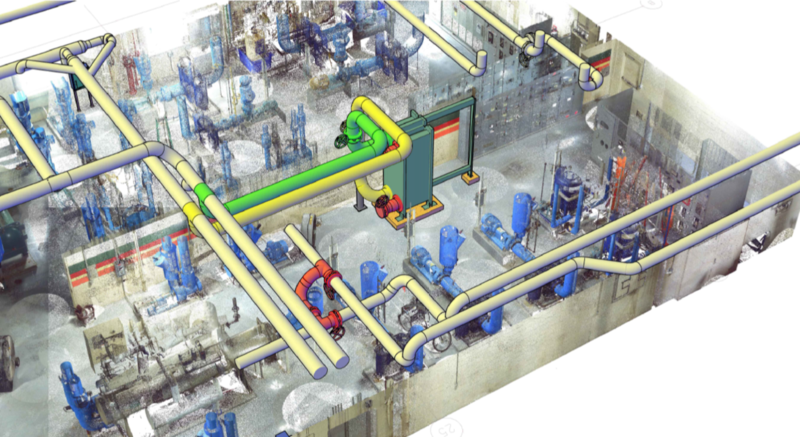 We combine individual scans to create a complete “point cloud” of your facility. Why is 3D scanning useful? We use the point cloud to verify dimensions, check clearances, and extract geometry to create accurate drawings. While it doesn’t replace traditional field work, it means we can verify dimensions without leaving the office. It also allows us to measure in difficult to reach areas, like high ceilings and above process lines. What does my facility gain from 3D scanning? Aside from the benefits of using the scans during the design process, you also get an accurate as-built 3D model. The point cloud can be opened in modelling software like AutoCAD, and we can export the project in a format that allows you to view the scans with no software installation. You can use the scans to virtually go through the space and take measurements for later projects.